LONDON, England -- A team of open-source researchers investigating the crash of Malaysia Airlines Flight 17 has published a report it provided to Dutch prosecutors linking the commanders of a Russian military unit to the plane’s downing. Bellingcat researchers say Russia's military chain of command was linked to the downing of the MH17 airliner over eastern Ukraine. 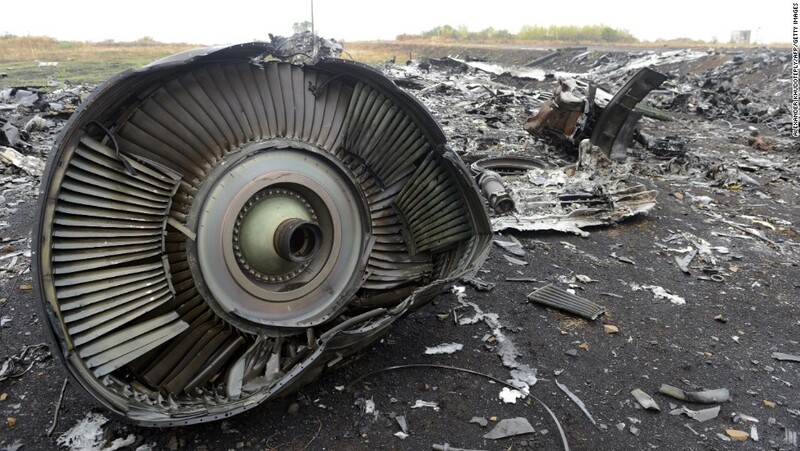 The latest report, released on February 24 by the British group known as Bellingcat, links higher-ups in Russia's military chain of command to the tragedy and adds other details building on earlier investigations into the July 2014 downing of MH17. Its previous reports had identified Russia’s 53rd Anti-Aircraft Missile Brigade as being the likely source of the missile that Dutch aviation officials say brought down the jet, killing all 298 people on board. But it adds to the growing body of circumstantial evidence suggesting Russian complicity. This includes personal information about Russian military officers and enlisted soldiers who Bellingcat alleges specifically knew of, and possibly even manned, the Buk-M1 surface-to-air missile system believed to have brought down MH17. Bellingcat in December provided a full version of the report to Dutch prosecutors, who said they would "seriously study" the group's claim that its research identified up to 100 Russian military personnel who might have knowledge of the movements of the missile launcher that destroyed the Boeing 777. The group redacted most of these soldiers' names and blurred images of their faces -- culled from photographs and video published on social media and news sites -- in the public version it released on its website. MH17 was flying from Amsterdam to Kuala Lumpur on July 17, 2014, when it disappeared from radars over eastern Ukraine. Wreckage from the plane and its victims was found strewn over a wide area where Russia-backed separatists had been battling Ukrainian government forces. In October 2015, the Dutch Safety Board, a government agency charged with investigating aviation disasters, said the jet was downed by a surface-to-air missile, and identified the 320-square-kilometer area from which the missile was fired. The area was mostly controlled by separatists at the time. The board stopped short of assigning criminal blame, however, something the four-nation Joint Investigative Team has been charged with doing. The Joint Investigative Team did not immediately respond to an email from RFE/RL seeking comment. Russia has strenuously denied the fighters it supports in eastern Ukraine were responsible or that it supplied the missile system. A leading separatist commander initially appeared to take credit for firing a missile and downing a Ukrainian jet, but those claims on social media were later removed. Russian officials have also put forth myriad alternate theories, including claims that MH17 was downed by a missile fired from a Ukrainian fighter jet. Bellingcat has previously documented what it says is evidence that the Buk-M1 missile system purportedly used to shoot down MH17 was moved between June 23 and 25 to the Ukrainian border, near the town of Luhansk, and ultimately fired on the plane from a position near the Ukrainian town of Snizhne in Donetsk Oblast. It says that the convoy was largely made up of vehicles from the 2nd Battalion of the 53rd Anti-Aircraft Missile Brigade, based near the southern city of Kursk. The new report details the chain of command for this battalion. "There is no direct evidence that soldiers or officers of the 53rd Anti-Aircraft Missile Brigade were part of the crew of the Buk-M1 that likely downed MH17 on 17 July 2014," the report notes, though it adds that a Russian crew may have moved together with the Buk-M1 across the border into Ukraine. Bellingcat said that if "the Buk crew consisted of Russian soldiers and officers, they were likely selected by" a man identified only as "Dmitry T.," who was "very likely" the battalion’s commander, or the commander of the 53rd Brigade, Colonel Sergei Muchkayev. Bellingcat also said it explored the theory that Russian units transferred the Buk-M1 to separatists in eastern Ukraine. "This scenario, however, seems unlikely, mainly because a Buk missile launcher is a very sophisticated and expensive weapon and it is very unlikely that Russia would turn it over unsupervised to a group of separatists without having adequate training," it said. The chain of command that Bellingcat ties to the MH17 shootdown includes Muchkayev’s superior, Colonel Aleksei Zolotov, who was promoted to Chief of the Air Defense Forces of the 20th Army, which encompasses the 53rd Brigade. But while Muchkayev may have made operational decisions regarding crews and the makeup of the Buk convoy, Bellingcat said the order more broadly to move military equipment across the border was likely made at top levels of the Russian military hierarchy, the Kremlin, and even by President Vladimir Putin himself. Bellingcat said that, if its conclusion about the Russian Buk missile launcher that allegedly downed MH17 is correct, the Russian Defense Ministry "bears the main responsibility for the MH17 tragedy, shared with the military commanders and leaders of the self-proclaimed Donetsk and Luhansk People’s Republics," the names of the separatist organizations in eastern Ukraine. Other international media, including The Associated Press, have pinpointed Buk-M1 systems in the eastern Ukrainian town of Snizhne on the day of the plane’s downing, and accompanying soldiers who spoke with accents from Moscow and other regions in Russia. Cell phone conversations intercepted by Ukrainian intelligence services and subsequently released by the Ukrainian government show rebel commanders on the day of the jet’s downing discussing the firing of a missile, thinking that the aircraft that was targeted was a military jet. The Joint Investigative Team is expected to release the results of its criminal probe sometime later this year.